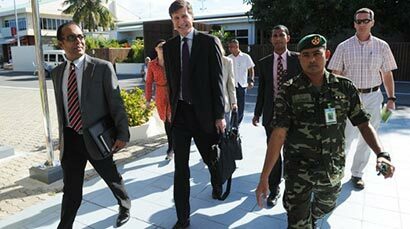 Male: A top U.S. government official met with leaders in the Maldives on Saturday to get a fresh assessment of the political situation in the Indian Ocean nation. The United States initially recognised the new Maldives government on Friday. It later backtracked, saying the situation was unclear. Male remained peaceful on Saturday. There were no signs of extra security on the streets and people went about their normal lives. This guy messed up Sri Lanka and now he is venturing into the Maldives. Believe this guy has nothing to do in Washington and so sets off on this junkets on the broke American taxpayer’s expense o spread his stupidity to SE Asian countries. If our EAM has any guts, they should deny entry to this guy at Kaunayake when he arrives next.